RIGHT OF CHOICE FOR ALL UTILITY CUSTOMERS! reach all members of the House Energy Committee! It is a new day now for smart meter legislation. We have more support for such a law now than we ever had before. To win this fight, it is critical that we persuade as many of the House Energy Committee members as possible. If enough are convinced of the necessity of such a law, a hearing will be scheduled on the law that has been drafted by some representatives who are on our side! After such a hearing will come a vote of the Committee to report the proposed law out to the full House with a recommendation that it be passed there or not. Later, of course, we will have to introduce a companion bill on the Senate side and follow that bill through a hearing and, hopefully, a favorable report out of the bill to the full Senate. We desperately need volunteers! We need people who care enough about this issue to spend a day going into one or more of the districts of the 25 reps who are on that Energy Committee. 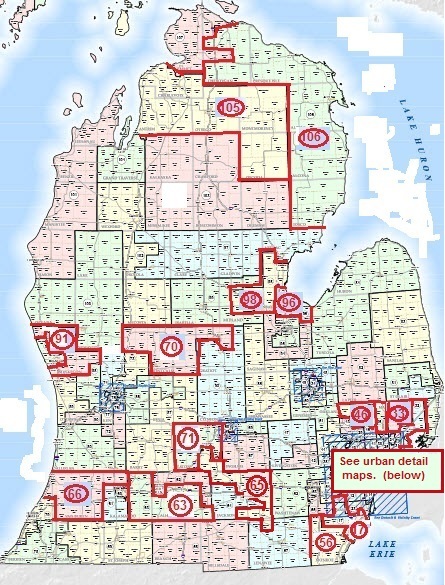 You will find above a map of the lower peninsula of this state with all the district locations marked. Most of these districts are within a few hours driving distance. Find a friend to go with you and make a day of it! Each of these flyers has a reverse side that is different according to what districts you plan to work. Contact Dave Lonier (248) 373-9111, or Dave Sheldon (248) 604-7545 and we will send you a flyer customized to your district(s). Once in district, the task will be to find a highly trafficked location, which could be a supermarket, library or post office, and hand out flyers. Those who receive the flyer will be asked to phone their state House representative and tell him or her that they don’t want a smart meter on their home AND ask that rep to back a new smart meter bill soon to be introduced. PLEASE CONTACT DAVID LONIER (248) 373-9111. Let him know which district you will be working and he will coordinate to avoid duplicated efforts. Click here to reach web page where we have detailed maps and a complete list of House Energy Committee members,and their contact information. This entry was posted in Actions by State Government, Actions by Utility Companies and tagged Consumers Energy, DTE Energy, Michigan House of Representatives, Michigan smart meters, smart meter bullying, smart meter law, smart meter legislation by Vigilant Dave. Bookmark the permalink. After repeated attempts and tactics over the last 2 years to change my analog meter,Sept 29th DTE tech with security knocked on my door,handed my wife a letter and they left and within 5 minutes our power was cut at the pole. We never received any “10 day” notice in the mail.We called the # on the letter, operator was very rude and said i will give him your # and he will call you.No call back as of Saturday.I sould not have to sacrafice my families health and safety to have a “public service” Sorry to be posting off topic.Has there been any news on is piece of legislation?Are there others in a simular situation? And we never received any notice in the mail regarding a shut-off. Ron, DTE turns off power under the pretext that a customer has created “an unsafe situation” by putting a guard on their meter. This allows them to act under a Public Service Commission regulation that requires no 10 day notice. It is all b.s. of course. As to the legislation our smart meter bill (HB 4916) had its first reading on the floor of the House last week and was assigned to the House Energy Committee chaired by Aric Nesbitt. This man has a history of blocking earlier smart meter bills, but we will persevere! How ABOUT POSTING THIS TO YOU SITE? MICHIGAN PUBLIC SERVICE COMMISSION , SECTION 460. 62, IT SAYS MPSC IS TO HANDLE HEALTH AND SAFETY OF PUBLIC, THEY HAVE NOT DONE THAT SINCE DAY ONE OF SMART METERS INSTALLATION. INSTEAD THEY SAY THEY HAVE APPROVED SMART METERS (WHICH MPSC DOES NOT HAVE QUALIFIED PERSONNEL TO DO SO) AND HANDED ALL DECISIONS TO UTILITIES ACROSS MICHIGAN. MPSC IS IN NEGLECT TO INFORM PUBLIC OF HEALTH AND SAFETY ISSUES ABOUT SMART METERS BEING INSTALLED BY UTILITIES ACROSS MICHIGAN. CIVIL RIGHTS HAS ACCEPTED COMPLAINT UNDER THAT VERY ACTION OF MPSC. THIS NEEDS TO BE PUT ON FACE BOOK! What is the timeline for this volunteer project? I will be out of town until 10/20. Lynn – We are pushing hard right now to reach members of Energy Committee, but there will be a continuing need to flyer other districts – at least until we know our bill has been scheduled for a hearing. GREAT! VERY nice publication and simple to follow. Sorry to report: FLYER 1, AND FLYER 2: See back side of flyer…… INFORMATION IS MISSING AND NEEDS CORRECTIONS. WE NEED UPDATES! Can you help get this accomplished? Dominic and Lillian – I will do updates of the map showing areas worked or still needing to be worked. Should have an update later today. MPSC is in neglect of not informing public of health and safety issues of ami smart meters, under MPSC regulation SECTION 460. 62, MPSC has responsibility to inform public of health and safety issues of equipment installed by UTILITIES across MICHIGAN. Civil RIGHTS has accepted complaint regarding this health and safety issues of not informing public. . MPSC is not JUST about regulating rates of UTILITIES, it is also responsible to inform public of health and safety issues of equipment installed by UTILITIES. Keep fighting for your rights, we are getting small glimmers of hope here in Victoria Australia.